The big rock. One of the most anticipated sights (for me at least) of the trip. Waiting was the hardest part though as we had to pass Mt. Conner (aka Fooluru), visit the shops and have lunch at the Cultural Center before visiting the big rock itself. 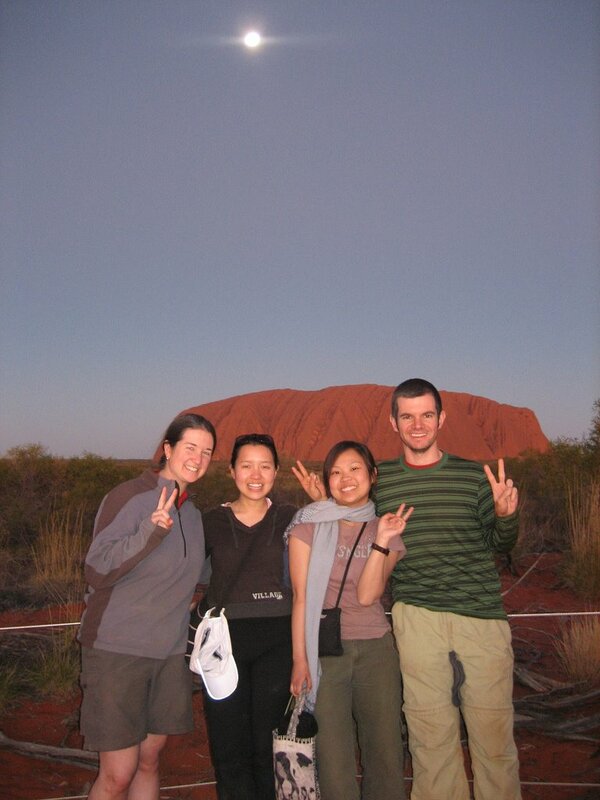 Just under nine years ago I came to visit Uluru and this area. I remember it for its other worldly feel and what a profound impact it had on me as a person. It is a spot that in my mind makes one appreciate one's spot in the world. That you are just a part of a much, much larger thing. What that larger thing is is in the eye of the beholder. It turns out all of that time away hasn't diminished those feelings at all. It still for me remains an emotionally important place. For that I'm terribly thankful. I just wish I could feel the same way about the situation of the Aborigines. Drew's stories of the pressures they are under to keep Uluru open (in some cases in open defiance of their laws and traditions) so that money-bringing tourists can climb the rock and how much of their culture has been pillaged is both depressing and disgusting. They do have ownership of the land once again but the cost seems very, very extreme. Our experience was (hopefully) a good balance of curious tourism and respect. Shunning the thrill-seeking (and in my mind, selfish and thoughtless) folks heading up the rock, we set off on a nine kilometer hike around the base. Drew led us for the first kilometer or so, providing us with information on some of the sacred sites and on the geology, and then peeled off to have some quality time with his dune buggy mags while we hoofed it the rest of the way around the hot, dry track. It was a photographer's dream (or nightmare!). Every corner, every next view brought more cools sights that we all burned up our memory cards (though as usual Thorsten was taking pics at a 10-1 ratio). So many different colors, shapes, textures and pictures give you a sense of a million little pieces making up the greater being. In fact, we took so long taking pictures that we almost didn't get back around in time to head off to catch sunset from the viewpoint. Sunset was what sunset always is at Uluru: an unique experience. Watching the colors of Uluru change as the sun departed reminded me of what a special place this is. And sipping champagne (even in plastic mugs) with new friends just added to the experience. It's a difficult place to get to (Uluru is 400 km from Alice Springs though you can now evidently fly into the resort of Yulara as well) but well worth it for anyone making the trip to Oz. It really meant a lot to me to show this to Becca and have her experience such an amazing place and I'm just glad I had the opportunity to experience it again. Day eight started very, very early for us: a 5:30 am wake up call to catch sunrise at a location that gave us both views of Kata Tjuta (aka the Olgas) as well as Uluru one last time. Our lack of sleep was rewarded with a plethora of colors. Of course the same lack of sleep caught up with us later as we hiked the Valley of the Winds. I hadn't remembered whether I'd actually done this hike on my previous trip until I saw this view and then it all came back. This time around though I was happy to be hiking it in 20-25 degree Celsius temps vs. the 45 degrees it was last time around. Becca especially liked this hike. Something about the views kept a smile permanently on her face (that is when she wasn't mother henning Chu for not bringing any water).